Four of South Korea’s leading defector-run media outlets have begun jointly lobbying the government on issues of mutual interest and their first target appears to be a mediumwave (AM) radio frequency. Radio Free Chosun, Open Radio for North Korea, Daily NK and OTV have come together under the “Unification Media Group,” Daily NK reported. The four have a joint goal of reaching a million North Korean adults within the next five years. Under current conditions, that’s all but impossible via TV or the Internet but could be done by radio. Radio Free Chosun and Open Radio for North Korea have attempted to reach North Koreans before using shortwave but those broadcasts can’t always be received clearly. Differing atmospheric conditions can affect reception on a daily or seasonal basis, frequencies generally change once or twice a year and North Korean authorities often aggressively jam the programs by broadcasting noise over the top of them. Switching to a mediumwave frequency would be much more successful, the four media outlets assert. But success is far from clear. Reception of mediumwave signals is much more reliable than shortwave and, given enough power, a mediumwave transmitter in South Korea could easily cover the entire Korean peninsula at night. South Korea’s KBS takes advantage of this with its Social Radio broadcasts, which easily cover most of East Asia overnight on 972kHz, and the signals of both Pyongyang Broadcasting Station and the Korean Central Broadcasting Service can also be heard across a wide region. In Tokyo, for example, it’s easy to listen to domestic South and North Korean transmissions during the evening. South Korea has reacted to the ease with which North Korean stations can be heard by jamming them. Loud noise covers the broadcast making it difficult or impossible to hear. Here’s what Pyongyang Broadcasting Station sounds like on 855kHz in Paju, just south of the inter-Korean border. On shortwave, broadcasts would simply change frequency — something that evades the jamming for a few days but also means listeners have to hunt down the station. Mediumwave transmissions are much more regulated and frequencies rarely change, so while the position on the dial would be consistent, the broadcasts would be highly likely to attract jamming. Getting a mediumwave frequency might not be simple. Japan, the Koreas and China are highly regulated broadcasting markets where there are many hurdles to getting on air. 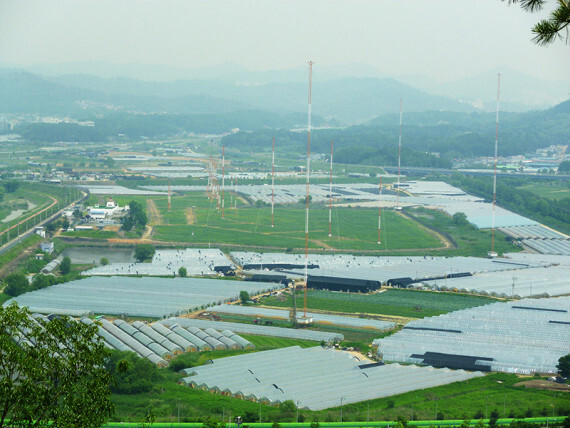 Any frequency would also have to be coordinated with neighboring countries so, for example, a new transmitter in Seoul doesn’t inadvertently cause interference to a local Japanese radio station at nighttime. A preliminary gauge of how successful this plan might be could come from North Korean mediumwave. If the government considers such a transmitter might be effective in reaching a large number of the North Korean people, we can expect denouncements and threats on KCNA. 3 Comments on "Defector media outlets align, want AM radio outlet"
I was at my Japan mountain cabin writing, isolated with no car, phone or tv, when Kim Il-sung died in 1994. A kind soul sent me a telegram to alert me and I turned on my shortwave radio to get Pyongyang’s side of the story. Medium wave for broadcasts going into NK always seemed important, and it was mystifying that the U.S. — apparently much more interested in broadcasting to China — took years to set it up for Radio Free Asia and then, pretty quickly, abandoned MW. I don’t know whether it’s been restored. Didn’t those MW signals come from a nearby country that is NOT South Korea? A powerful Medium-wave signal could be heard all over the Korean peninsular but it would be jammed. A powerful shortwave signal on about 6MHz would easily cover all of the North but would be also subject to jamming and, I would guess, that not many people in the North would know much about Shortwave. Kim Jong un is a great man. I think the movie that was made in the usa is an outrage. I have written a novel called memoirs of a terrorist (Bin Laden’s Lost Agenda). in it I as a lone wolf terrorist kill military , police and americans in ways that can never be defended against.the fbi is currently reviewing it. I would love to offer it to MR. KIM UN to publish from n. Korea. I am sure the usa will be as outraged at it’s publishing as N.K was by the recent movie. my offer stands, for MR. UN anytime.